Sunday 14 August. Ride to Gunwharf Quays, Portsmouth. I led this ride on behalf of Arthur who was away. We had 11 on the ride with myself, Gill, Jo, Avryl. Phil and Mary, Richard, Mike Trussler, Sam, Ernie and Jeff. 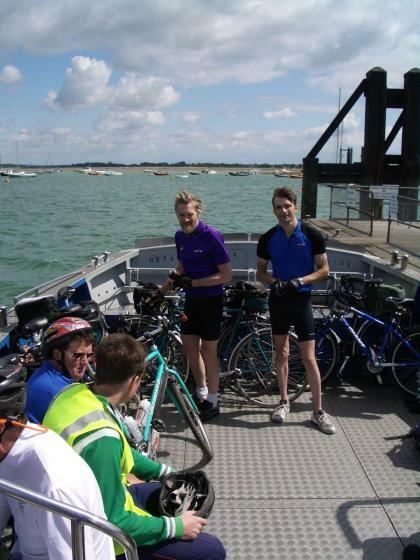 Adrian made it up to 12 for the route from Emsworth to Portsmouth. The weather was fine with cloud and sunny intervals but a strong NW wind. There were some threatening black clouds at times especially in the afternoon but never coming to more than a few spots. We took the usual South Coast Cycle Route lanes to Emsworth where we stopped for elevenses. 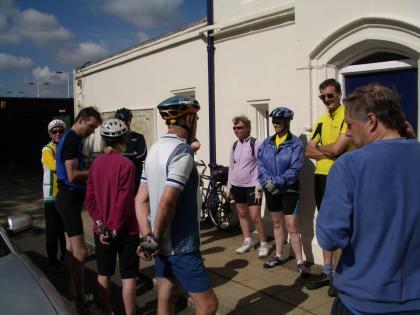 The ride continued to Havant and then down the Hayling Billy cycle path to West Hayling and on to the Ferry. We arrived just as a ferry pulled in. In Southsea I led the ride along the Esplanade and then across to the Fishbourne Ferry road and along to Gunwharf Quays. 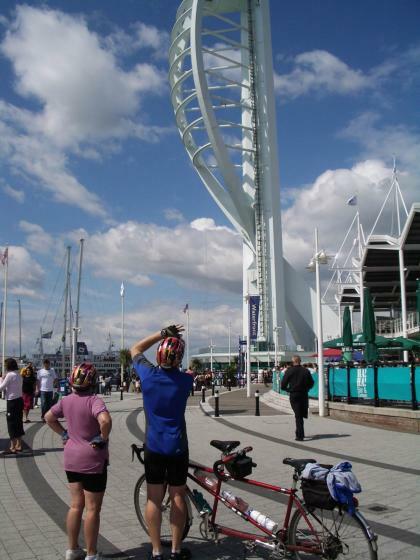 We had a look at the Spinnaker Tower now completed and gleaming white and looking very spectacular. It will be open to the Public in about 3 weeks. Lunch was taken at a caf? overlooking the water. We returned on cycle paths to Cosham and then back roads to Havant and Rowlands Castle for Tea. We then headed back via Westbourne. Mileage to and from Chichester Cross was 47. Jo took some photos there to celebrate her longest mileage to date. Another evening of excellent cycling weather as 7 riders left Felpham for Binsted by way of Middleton, Yapton, Ford station and Tortington. After a slow but steady climb from Tortington we were rewarded with a downhill stretch as the lane dropped down into Binsted Wood, and at the point where the tarmac ran out we stopped for a brief look at the Madonna pond. Binsted is mentioned in the Domesday Book and there are many myths and legends about the woods and pond (or Binsted Lake as it was called in earlier times). Paranormal activity is said to have been observed. However it is known that the statue of the Madonna was placed there in 1946 in more mundane circumstances. Leaving the pond for the short climb out of the copse and back into civilisation, the tarmac started again as suddenly as it had stopped, and the pub was soon reached. On arrival the pub manager greeted us to explain that they could not open the garden gate, and we were invited to wheel our bikes through the lounge bar, to the bemusement of the regulars. Repeating this performance for the return trip, we then set out to complete a circular ride by taking the sharp drop down Hedgers Hill and then up the other side, to Walberton, North End, and then back to Yapton, Middleton and Felpham. Round trip mileage was 18. A lovely sunny day enjoyed by all. We met at Petersfield Station at 10.30 where parking is free on Sundays. All 8 of us had come by car. 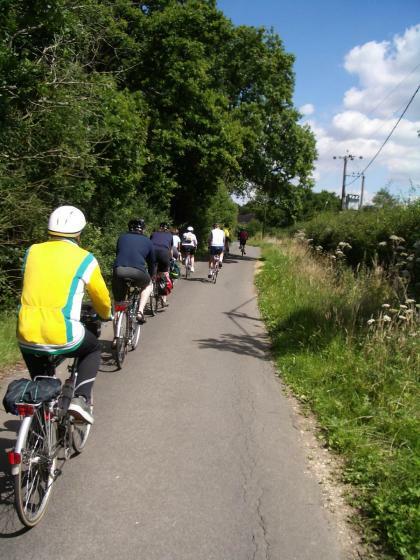 We were then joined by 4 riders who had cycled from Chichester on the longer ride led by Edwin. We headed South with wonderful views from Teglease Down and towards Ripley on lanes parallel with the busier Hambledon roads. The Horse and Jockey was our lunchtime stop and here we met two more of Edwins riders who somehow had missed him. All 14 of us continued east. through Denmead and on to Clanfield. Edwins group left us here while we continued on to Butser hill - yes, to the top, and then came our reward. Oh, Edwin you did miss out. Halfway down a whizzee hill (Harvesting Lane) is a Barn where the most delicious cream teas are served on the lawn outside. Only one person was strong enough not to succumb. Back to Petersfield. A farewell to Clare and Vernon and to wish them well on their 2 year round the world bike tour, and back home. Many thanks to Jan Bambridge who lives in this area and who planned the delightful route.